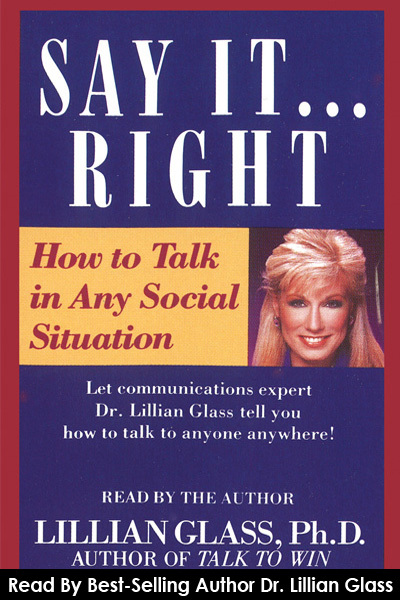 Audio download read by Dr. Lillian Glass, Move over Dale Carnegie, who may have been the communication guru close to a century ago, modern day communication guru Dr. Lillian Glass presents a dynamic guide to exactly what to say in almost any business or social situation. Dr. Glass provides the key to speaking confidently, powerfully, and persuasively, anytime and anywhere. The methods and strategies in this book which have helped her high profile clients from A list celebrities, sports stars, newscasters, politicians, and world leaders is now available for you. It will give you the self confidence you need to have the winning edge in life and to speak to anyone under any circumstances at any time as you will learn exactly what to ay and how to say it in hundreds of verbal encounters. Never be shy again, learn what to say to hostile people, talk to foreigners, introduce yourself with ease, become more approachable,handle office jealousy, accept and give compliments, deal with sexual and racial slurs, know what to say to people who are grieving or ill. After reading this book you will never be at a loss for words again.